Now today’s sound designers and game makers can stock their audio production kitchen with a fresh homemade collection of delectable sound. It’s a flavorful collection of cooking sound effects featuring 650+ tasty sound files. Includes sounds of baking actions, sounds of eating, sounds of chewing, chopping sounds, plates and bowls, wet and dry ingredients sounds, frying baking, sounds of water and ice. It’s your private recipe for making a fun and complete 5 star cooking experience! Cooking Game – Sound Effects Library, just released. Chop the veggies, sprinkle the spices, manage the menu and get your audio production cooking with Cooking Game sound effects. It’s a flavorful collection of cooking sound effects featuring 650+ tasty sound files; baking actions, sounds of eating, chewing, chopping, plates and bowls, wet and dry ingredients sounds, frying baking, sounds of water and ice. You can even take your restaurant on the road with ambient loops and background sounds of outdoor carnival, sounds of sea side beach and various restaurant background sounds. Sound effects are categorized for easy identification; game actions, chef and customer emotes, user interface, pickups, power ups, ingredient actions and more. Additionally, Cooking Game features all original recordings and sound designs by Epic Stock Media sound engineers. Sounds are meticulously curated to suit cooking game, film, video, and motion graphics applications. 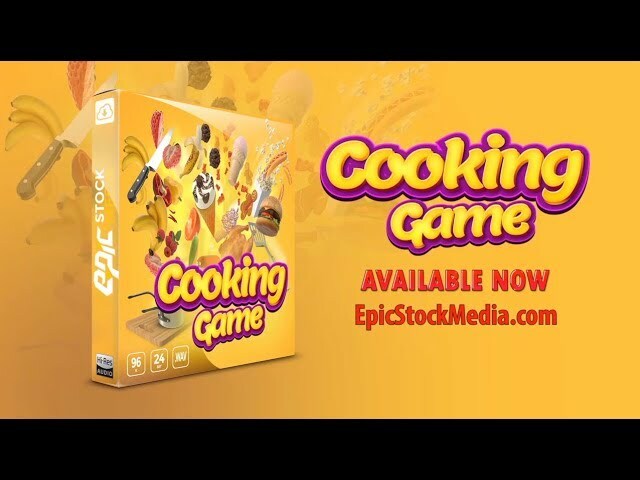 Cooking simulation games and cooking dash and time management games are some of the most popular video and app game types in the gaming industry. Kids of all ages (that’s you too mom and dad) from around the world enjoy the challenge of running a simulated restaurant or kitchen. Players prepare foods, make soups, slice bread, chop ingredients and score big points when they make sure their customers are happy and served on time.